Karmic City: The City of Lord Vishnu is a second book in the trilogy by Hema Myer Sood. The plot based on the spiritual awakening in the domain of Lord Vishnu. The cover looks lovely. It indicates sea and aquatic animals which are considered as the Lord Vishnu's home in Indian mythology. The story continues with the Soul (an ageless and nameless entity) describing different aspects of life, death, and Karma to Aditi, Virat, Vaidehi, and Karthik. It is considered that the city of Lord Vishnu leads to the domain of Karma and sustenance. The author describes all the nine avatars of Lord Vishnu and their purpose on the Earth. When we wallow in misery and rave and rant about our misfortunes, it may eventually increase our Karmic debts. To decrease it one must follow a spiritual path, do the right things, and always show gratitude towards nature and supreme lord. They will illuminate our path in darkness. Lord Vishnu always supported those who were righteous and seek his help. Our spiritual guides help us to choose the right environment to be born in and when they feel that we have completed our tasks death occurs. This book gives a new perspective towards our relationship with God which is now only become a one way. The human aura which can be seen and influence our surroundings. The author describes the need for Sathwic food and thoughts. Stale meat is indicative of high negative energy that is imbibed by the person consuming it. When an animal is killed, a fear enters in them, and a chemical reaction takes place within them, and negative energy begins to build up. The book is divided into two parts. The first consists of the Supreme Purusha and in second, Prakriti (Mother Nature). The author scribbles poems on different topics which provide noteworthy explanations. 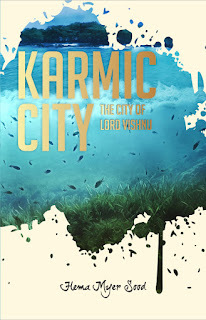 I really like the previous book in the series, Karmic City: The City of Lord Brahma, but I love this one. I read this book slowly because I want to understand its explanations according to my level of consciousness. The words can't describe how good this book is. Once you read this book, you'll definitely feel or connect with nature or a higher entity in a different way. This book changes my views on meditation and gives me a fresh start. The author uses different examples to make the readers understand heavy stuff. Few things felt repetitive. The language is simple and comprehensible. Hema Sood further describes Kundalini Chakras, the temple of the soul, human's relationship with Gods and the way to reach them, Geeta's shloka in an ultra-fine way. The Mahabharata always fascinates me, so I really enjoyed the part when the author describes about the Arjuna's low spirits and confusions which are altered by Lord Krishna. It's another magnificent and rich piece written by Hema Myer Sood. I recommend it to all. All the spiritual seekers and readers must read this book.